The used to request for the uncertified copy of your relative’s birth or death certificate is effective when you want to research your genealogy. The concerned department or the institute provides the complete record when you provide them complete detail. The death or birth certificates of a particular person can be obtained from the registrar office of the same town or city where the person was born, or the death occurred. So, to get the uncertified copy, the letter is written to the registrar office. 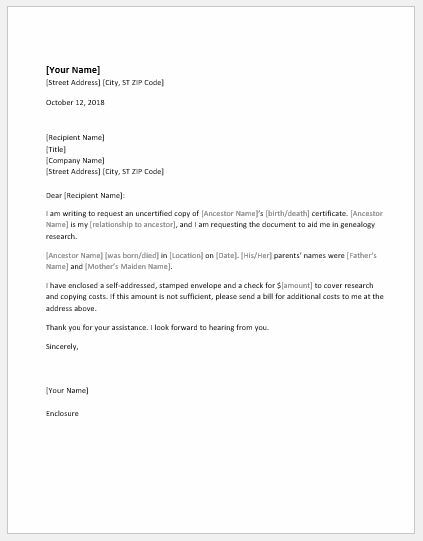 How to write this request letter? The request letter for obtaining the uncertified copy of birth or death certificate is a formal letter. The language to be used in the letter should be chosen with great care. The concerned authority should be facilitated with the complete information of the person whose birth or death certificate’s uncertified copy is required. The letter should be started with your introduction. The introduction includes your relationship with that person and also the statement of the court permitting you to obtain the information. The reason for writing this letter should also be stated at the very start of the letter so that the reader will know. The reason for asking for the uncertified copy of birth or death certificate should also be mentioned in the letter. End the letter with your gratefulness and thankfulness for considering your request and putting efforts to work on it. Since you want the record of a particular person to be searched, you should provide enough details in the letter such as name, date of birth, a date of death (in the case of the death certificate), etc. the concerned department will use that for releasing the details it has. Keep the letter to the point and as short as possible as the reader received a good many request letters and he/she does not have time to read the long letters with unnecessary details. The following letter will guide you to write a request letter in a good way. DOWNLOAD, make your personal relevant changes and get the job done.